Tiger-Banded Peckoltia is a variety of Peckoltia type of fish that comes from the Loricariidae family. These fish breeds hail from the Amazon River Basin. They prefer a moderately soft and slightly acid water environment, with the temperature ranging from 72 degree Fahrenheit to 78 degree Fahrenheit. The Tiger-Banded Peckoltia is a nonviolent fish and has a maximum body length ranging from 3 inches to 4 inches. This is a wonderful variety of fish that is a great algae eating variety that consumes the algae in the tank and assists to maintain the tank clean. In fact, this is an ideal fish variety to maintain in community tanks for having better control over the algae. 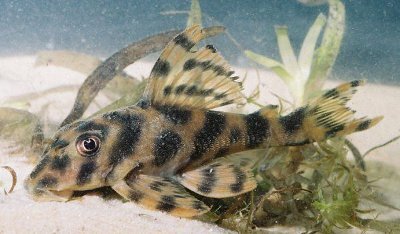 Tiger-Banded Peckoltia fish varieties are omnivorous, and they feed on algae and other plant matter in the wild. In the aquarium they are fed with Spirulina wafers, pieces of romaine lettuce or zucchini. The Tiger-Banded Peckoltia fish breeds are cave spawners and do so in captivity. The male fish breeds will build up small spines on the primary pectoral fin and they will continue along the flanks. On seeing this, the female breeds will boast a stockier body form. Even though several hobbyists have had their fish produce in spawning tanks or community tanks, there has not been any extensive aquaculture reproduction of this fish variety. However, nearly all Tiger-Banded Peckoltia fish varieties are still brought in from the wild. The male Tiger-Banded Peckoltia fish will choose a cave and invite the female fish to enter for getting ready for laying eggs. As soon the female fish laid the eggs, the male will look after the eggs, protecting the nest and the female fish will be driven out. The fry will boast big yolk sacs, so it will not allow for swimming before 8 days of the hatch, during this stage they can be nourished with recently hatched brine shrimp. The average lifespan of the Tiger-Banded Peckoltia fish breed ranges from 5 years to 8 years.